At first glance, the casual reader might be put off Dawn Finchâ€™s first book. Published through Authonomy, which is part of HarperCollins devoted to showcasing unpublished authors, the review copy is ring bound in A4 (a paperback release isnâ€™t due until September 2013 – Ed). However, upon turning the first few pages, the reader finds themselves drawn into the world of Toby Dâ€™Scover, head of Section One, part of the Brotherhood, a mysterious organisation staffed only by ghosts. Governed by the Senior Council, the Brotherhoodâ€™s aim is to quell dangerous spirits and prevent the living world from learning of them. Dâ€™Scover is seeking the Sentinel â€“ a spirit whose coming was foretold in ancient texts, who will save the world by defeating demons sent to destroy it. Alerted to the imminent death of an unnamed homeless boy dubbed â€œAdam Streetâ€ after the location he was found, he believes he may have finally found the Sentinel. Dâ€™Scover and Adam join forces with a young witch, and begin their journey. Facing three elementals, will the trio discover the real Sentinel in time to save the world? 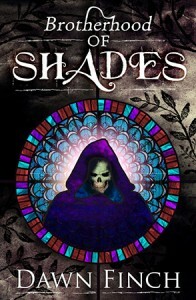 With Brotherhood of Shades, Finch has proven herself to be an author to watch. Her characters are well rounded, and the plotline develops quickly, building towards the thrilling conclusion.